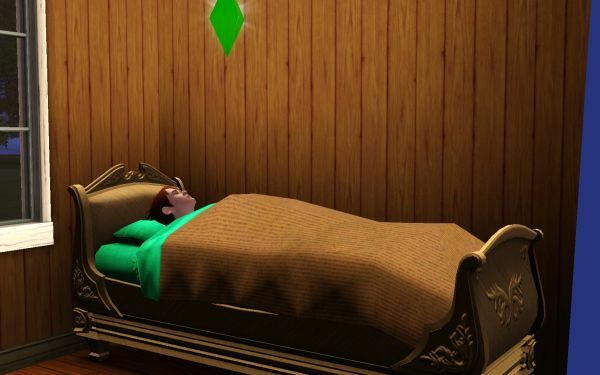 Sometimes I just lie in bed, looking at the shining plumbbob suspended in the air above me – no wait, that’s my sim. Me, I tend to fall asleep almost as soon as I get my headphones on. It is just getting there that takes a long time! There is a saying “I’ll sleep when I’m dead”, and sometimes I wonder if a part of me is thinking that way. Unfortunately, this attitude is likely to bring on the final sleep much earlier than necessary. Over the last few days I feel more and more “run down”. It takes less exercise to make me stiff and sore. I believe sleep may be the missing ingredient. I have found in the past that physical exercise requires more sleep. For mental work, such as my job, a nap will do wonders. But when I actually burn off 500-1000 calories and use my muscles in slightly unfamiliar ways, my body needs the downtime to put itself back in full working orders. Unfortunately, of late my good ideas appear as on cue around 11 PM. Well, they may not be “good” in the Biblical sense, but they certainly are ideas. Whether journal entries (which may or may not ever be posted) or fiction, they emerge with unprecedented clarity when the clock should have encouraged me to put head to pillow. I don’t generally suffer from insomnia these days. Well, to some small degree from the insomnia of the asylum seekers upstairs, who still tend to move their shouting closer to the bedroom at 0 – 1- 2 AM, but I have largely gotten used to that. Besides, I have the delta brainwave entrainment. But neither sleep nor delta entrainment go well with writing fiction about magic worlds or unexpected college romance. Or for that matter entries like this, finished around 23:55 European time. This entry was posted in meta, slice of life by itlandm. Bookmark the permalink.